Keith’s key strength is building experience. He’s been a builder all his life and he’s lived locally in all that time too. He knows what’s required for a building to withstand the local conditions and he enjoys good working relationships with the best contractors. Plus, he knows our system exceptionally well. 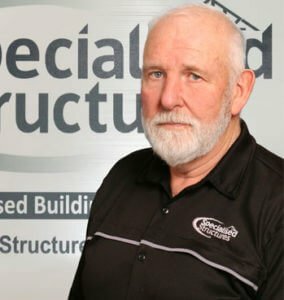 A qualified carpenter, Keith bought a Specialised Structures license mainly for the ability to draw on the expertise of a nationwide network. He saw good value in the system too; particularly the ability to build something that was not only durable and fit for purpose, but a cost-effective option for his clients. Owner of Keith McLeod Building, Keith also operates the Skyline Buildings franchise in Invercargill. He’s well known for his excellent project management, personally overseeing every project across his business portfolio. Keith’s many hobbies include diving, hunting, fishing and motor-biking. He sponsors Star Rugby club school boys and a local stock car.